Thingd (Thing Daemon) is building a structured database of every object in the world and then mapping those objects (and associated metadata) to people and to other objects. The concept is still in its early stages of being realized, but it is a big ambitious idea and one worth thinking more about. The easy (and slightly inaccurate) way to put Thingd in context is: Facebook organizes people, Google organizes information, and Thingd organizes things. The lines get blurry though and I’ve written before about how Facebook and Hunch are creating massive collaborative filters that can improve recommendations for ecommerce and deliver more targeted content and ads across the web. Thingd approaches the problem differently by focusing on the database itself. It’s basically a utility in the way that twitter has been described as a utility. It is a product whose core function is so basic that it can power a multitude of applications. That is the promise and the reason for the excitement. For example, Plastastic is a game for toy collectors that is built on the Thingd database (by Thingd). Because it pulls structured data from Thingd, the site enables extremely granular browsing. For example, you can browse for toys that are only 5.5″ tall. More importantly, you signal your purchase interest by clicking “Have it” or “Want it” (similar to Like). By “Wanting” lots of Handpainted Resin toys, Plastastic could show you other toys that people with similar tastes Like. So, what’s exciting is not necessarily the collaborative filtering, but Thingd’s structured data (as long as it is of high quality). Assuming an API is released, anyone could leverage Thingd’s structured data to build completely new kinds of web services. Since Thingd’s database will theoretically include every object, it could empower anyone to very easily become a buyer and (passive) seller via its marketplace. One could also imagine extending Thingd to other services: consider how Thingd could be integrated with Facebook profiles. It would be far more useful than Facebook Marketplace. Using image recognition, the database could also be used to power affiliate services on sites like Pinterest and Aprizi (similar to how Pixazza works). While an affiliate business model is a first thought, other more interesting models could emerge. Thingd also launched a platform for mobile developers called productids.org which provides access to >100 million UPC barcodes tied to Thingd’s database. So, if you’re shopping for a bike at a store, imagine an app that could scan a bike’s barcode with your smartphone and then browse for similar bikes based on the specific attributes you care about (style, number of speeds, material, color, etc.). You could check prices and availability online and at physical stores (via Milo). An integration with Google Goggles would be even cooler: take a picture instead of scanning the barcode. In addition to ecommerce business models, advertisers and publishers might also be interested in connecting to people based on users’ prospective (Want It) and historical (Have It) purchase habits. As long as the structured data is consistent and clean (very difficult to achieve if attributes are crowdsourced), there is a lot a developer could do with a Thingd API. The immediate challenge for Thingd is to continue improving the user experience while building and refining its database. While the experience on Thingd.com isn’t seamless yet, the company recently launched Fancy, which is a lot more user-friendly than Thingd.com in allowing you to tag images and discover new stuff. Fancy will make it easier for Thingd to collect data on more objects and there’s no doubt the company will be adding features as it rolls out (would be nice to have a bookmarklet for easier off-site tagging; small design tweaks like tiled images and infinite scrolling). It’s clear that there is no shortage of options for Thingd, so the question will be product focus and execution. I’m really excited to see how Thingd develops. It’s working on a truly massive idea. Design informs most of what we come in contact with whether it be architecture, mobile devices, cars, software and web services, or a school’s curriculum. Sentences are designed, edited down so they convey meaning with efficient elegance. “Good” design delights with its simplicity, its flexibility and ease of use. Design was on my mind while walking through the Museum of Natural History’s excellent exhibit on the race between Robert Falcon Scott and Roald Amundsen to first reach the South Pole (1911-1912). Perhaps it’s a strange place to be thinking about design, but expeditions, especially those attempting to first reach the South Pole, are amazing crucibles for design. Each team had to carefully select its route and take nearly everything with them: fuel, clothing, plenty of food for themselves and their animals, shelter, transportation, etc. It was critical to design the expeditions so that they would be flexible enough to meet changing conditions. In fact, Scott didn’t realize he was in a race until receiving a surprise telegram from Amundsen: “BEG LEAVE INFORM YOU PROCEEDING ANTARCTIC — AMUNDSEN”. It is through this lens that we can see how each team’s preparation, experience, and design choices impacted their efforts. Ultimately, Scott reached the pole only to find that Amundsen had beat him to it. Freezing cold, frostbitten, and running short of supplies, Scott and his team lost their lives on the return. Tragically, the remaining polar team was found only 11 miles short of their main depot’s relative safety. On the other hand, Amundsen’s team successfully reached the pole before Scott without any loss of life. How did this happen? What can design teach us about these outcomes? How can these lessons be applied to the less lethal, but similar challenges of building teams and operating companies? Scott’s Terra Nova Expedition had competing goals. Not only were they seeking to reach the South Pole first, but also they had various scientific goals requiring additional manpower and equipment. Scott’s expedition was well-publicized and he knew that the success of the expedition would hang on whether he reached the pole. While the scientific work was important, it was ultimately a distraction. Scott setup camp at Cape Evans since it was a better area for the scientific work they planned to complete. However, it was 60 miles further from the pole than Amundsen’s camp on the Ross Ice Shelf. Scott had already disadvantaged his team before the journey began. On the other hand, the Amundsen Expedition designed itself with one, clear goal: reach the south pole first. The route, equipment, team members’ skills, mode of transportation, food supply – everything – was selected for the sole purpose of reaching the pole first. Amundsen fielded a small, agile team with only nine men, some with arctic experience and others who were completely green. But they were built for speed and brought 52 dogs with them. In contrast, Scott had 65 men (including the ship team) when only five would make the final trek to the pole. In a showing of Amundsen’s focus, he took only two pictures the entire expedition while Scott’s team extensively documented their efforts and brought 35,000 cigars with them. Perhaps even more important was that everyone on Amundsen’s expedition understood that there was only one goal. This likely freed expedition members to make informed decisions without having to weigh any choice in the context of competing goals. Tellingly, on the return from the pole and nearing exhaustion, Scott’s team added 30 pounds of geological specimens to their sledges. Scott’s team also had a complex transportation plan that involved ponies, dogs, three motorized sledges, and “man-hauling” (like it sounds: hauling your own supplies). The motorized sledges cost 7x what the dogs and ponies cost combined, although three-quarters of the distance was completed with man-hauling. The ponies were only used for the first 25% of the trip as the ponies were not suited to travel up the Beardmore glacier. In an inauspicious beginning for Scott, one of the motorized sledges fell through the ice while being unloaded from the ship, and the remaining two were abandoned due to mechanical failures. Amundsen’s team kept things simple. They relied exclusively on dogs for transportation, calculating correctly that dogs would be able to make it over any terrain they would encounter. Despite their affection for the dogs, Amundsen’s expedition relied on weaker dogs for food, both for the dog team and themselves. Scott was reluctant to use dogs in this way although he didn’t shy from using the ponies for food. Scott also ignored the expert advice of Fridtjof Nansen, the famous Norwegian explorer, who told Scott to bring “dogs, dogs, and more dogs”. Scott received this advice while trialling his new motor sledges in Norway and, likely feeling the momentum of the sledges’ expense and the effort involved in developing them, decided to continue using them. While Amundsen fed his dogs with seals and penguins, Scott was forced to bring the ponies’ food from England and carry the extra weight during the expedition. Upon reaching Antarctica, Amundsen’s lead skier, Olav Bjaaland, redesigned the sledges, tents and footwear. While Scott’s team used the same sledges, Bjaaland shaved the Norwegians’ sledges down, reducing each sledge’s weight from 165 pounds to 48 pounds. Further, the boxes hauled on the sledges were designed so that their contents could be accessed without unloading them. The Norwegians also soldered their fuel cans closed to eliminate evaporation. Scott knew of the evaporation issue from his experience on an earlier expedition with Shackleton, but Scott’s expedition used cork plugs anyway, and were dismayed to find that significant amounts of fuel had evaporated by the time the team reached the depots. Lastly, Amundsen outfitted his men with loose-fitting fur clothing that kept them warm and dry, a technique he picked up from his experience with the Inuit. Scott selected closer-fitting windproof materials that trapped perspiration, leaving his team wetter and colder. Amundsen enabled the innate talents of his small team to run while successfully drawing on his experience and the advice of others. These were all fairly small design choices that, in combination, had a very positive impact on Amundsen’s chances. The grand vision was to achieve the pole first, but each expedition sent teams ahead to lay necessary route markers and set up depots. The markers made it easier to navigate their respective routes and the depots provided food, fuel, and equipment in the field. During critical stretches, Amundsen’s team methodically laid markers every mile, using pre-painted black food containers to show the way. Closer to the pole, he erected 6-foot cairns every three miles which included a note indicating the cairn’s location, the direction to the next cairn, and the distance to the next supply depot. These cairns acted as effective milestones for the team, aiding navigation and providing much-needed signals of progress. Scott’s depots were laid out less regularly and were marked with one flag each. Walls used to protect the ponies during lunch and night stops were used as markers, so there was no regular spacing to help with navigation. Unlike Amundsen’s markers, Scott’s were laid further apart making it impossible to travel on inclement days that had poor visibility. With a simpler and more structured design for route-marking, Scott’s team would have traveled regardless of most weather, and might have been saved. Building an effective expedition team meant finding the right balance of skills and personalities. 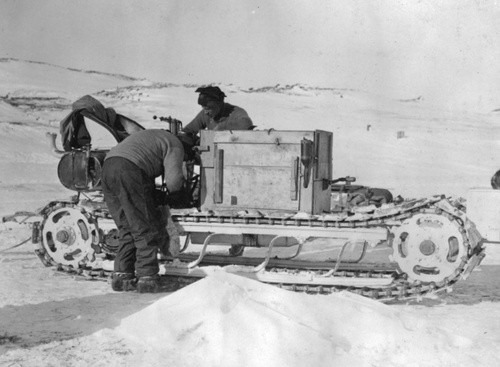 In preparation for the expedition, Scott hired an engineer, Reginald Skelton, to create the motorized sledges. However, when it came time to choose the expedition members, Scott bowed to the demands of his second-in-command, “Teddy” Evans, who objected to Skelton’s selection. Evans took issue with the fact that Skelton out-ranked him in the British Navy – Evans did not want a more senior officer to overshadow his position. Allowing this issue to become politicized seems to be a clear lack of Scott’s leadership, who should have found a place for Skelton and dealt with Evans’ concerns. Without Skelton’s skills, two of the three motorized sledges had to be abandoned after running into mechanical issues that Skelton likely could have fixed. The Norwegians were also accomplished skiers and were able to keep up with the dogs pulling the sledges. The Norwegians knew how to care for their dogs as well, keeping track of mileage and being sure not to overwork them. Amundsen even brought Bjaaland, a champion skier, to pace his team. While Scott also brought a Norwegian skier to train the rest of the men to ski, Scott didn’t require his men to train. This became a major hindrance as most of his British teammates had very little or no experience on skis. This hampered Scott’s progress as the men awkwardly learned to ski while on the expedition, while hauling their supplies, too. Scott’s lack of leadership and seeming willingness to let politics impact his selection of individuals with the appropriate skills put his whole expedition at a disadvantage. I may say that this is the greatest factor – the way in which the expedition is equipped – the way in which every difficulty is foreseen, and precautions taken for meeting or avoiding it. Victory awaits him who has everything in order – luck, people call it. Defeat is certain for him who has neglected to take the necessary precautions in time; this is called bad luck. The defining principle I take away from Amundsen’s success is that if something can be done simply, it’s almost always preferable to a complex solution. So, the next time someone offers you three motorized sledges (and nobody to fix them) for your polar expedition or 52 dogs, take the dogs. There has been a lot of discussion about the best educational background for founders and for those who want to join startups. Earlier this month, TechCrunch ran an article from Vivek Wadhwa which argued in favor of an MBA education. Similarly, Vinicius Vacanti (a former banker) wrote a great post, “5 Reasons Why I-Bankers Make Bad Tech Entrepreneurs“. Steve Blank wrote a very practical and balanced post about whether folks should get an MBA or an Engineering Management degree. Guy Kawasaki has pegged the value of an MBA to a post-college entrepreneur at negative $250k. There’s clearly a lot of conflicting wisdom out there. After reading some of these articles, my initial concern was that some of these perspectives could lead would-be entrepreneurs to question their ability to start a company based on whether they had the right background. But the concern is misplaced because anyone who could be dissuaded from starting a company based on one person’s opinion probably isn’t ready anyway. The bottom line is that if you are looking to start a company, formal education matters little: it is about what you can do. And what you can do – if you’re talking about founding a tech startup – is all about your vision and passion for the product and your ability to execute. For this reason, if you are deciding where to focus your formal education, I strongly suggest engineering. As my dad told me, it’s difficult to learn “hard sciences” once you’re out of an undergraduate program (unless you’re building on a background in hard sciences). While you might pick up a history book for leisure after graduating, you’re probably not going to relax by doing calculus or learning Cocoa. This is not to say it’s impossible to gain these hard skills once you’re out of college (I’ve had to do a bit of this), it’s just easier to learn these things in an academic setting when you probably have more time and fewer real-life distractions. I wouldn’t be overly concerned about gaining accounting and finance skills at first – these are very valuable, but again, the core value of a startup is not finance and accounting, it’s the product. You’ll acquire business skills with experience and if your startup gains traction, you will be in a good position to raise money and attract the talented sales, BD, and finance folks needed to build the product into a moneymaking enterprise. Assuming you have the knowledge, passion and ability required to start a company, get started on it. You don’t need to get an expensive graduate degree. And, if you have an expensive graduate degree, that doesn’t make you any less “able” as a founder or startup exec. Everyone has innate abilities regardless of educational background and, if you’re building a founding team, it’s your job to find people who complement your abilities. And if you’re a startup looking for exceptional people, it’s your job to recognize talent independent of a candidate’s pedigree or formal training. Finding the right people is complicated: use too coarse a filter (Ivy-only, college-grad only, no MBAs, MBA-only) at your own risk. Earlier this week Bijan Sabet at Spark Capital wrote a post, “An inspiring way to join a startup“. The post describes how a couple of companies in Spark’s portfolio had individuals offering to work for free in exchange for the possibility of a full-time position. I don’t know what the exact circumstances were for each candidate, but if the candidates were switching industries and this was their first startup, I’m a little surprised that this path is considered unique. Having lived this process as both a newbie and an employer, below is the story of how I got into the startup world and some thoughts on “try before you buy” hiring based on my experience. In August 2001, after I had worked for a couple years at JPMorgan (my first job out of undergraduate), I finally decided to quit and join a startup. I had known since before day one that I didn’t want to make a career out of banking. To me banking was a two-year graduate school program that would provide much-needed skills in finance and accounting that I didn’t get while studying economics and Russian in college. By the time I left, I thought I had the wind at my back. I had been offered a promotion to Associate and naively figured it would be easy to get a startup job. Wrong. During my two years at JPMorgan I had been reading everything I could about the NY startup scene and keeping a spreadsheet of all the NYC-area startups. I had even gone on a few interviews to test the waters. About a month after I left, I was out in San Francisco visiting a friend and woke up early on September 11, 2001 to catch my flight back to New York. I won’t recount that terrible day here, but needless to say I was in San Francisco for another week. Returning to New York many days later, I arrived in a different city than I had left. This was not a good time to be looking for a startup job. New York was reeling from 9/11 and the internet bubble had burst. Then I tore my ACL playing soccer at Chelsea Piers. Awesome. The day it happened, I had 24 hours left to send in my COBRA before it expired. I had the surgery and then focused my efforts on getting a job at Colloquis (then called ActiveBuddy), a developer of natural language software systems. I had already been following the company’s progress for some time. To me, Colloquis’s technology was indistinguishable from magic. I totally fell in love with it and decided I had to work there. My initial application (through the company’s website) was rejected. Then I had a stroke of luck and was introduced to the CEO, Steve Klein, through a mutual friend. Finally, I got a meeting with him. I remember it well. Steve was firing questions at me, and at one point he asked, “how much did you make at JPMorgan?”. I told him and he laughed. “That’s ridiculous!”, he said. “You’re two years out of school. You have no real experience. Nobody is going to pay you that outside of finance.” I told him I knew that and that I wasn’t expecting a similar salary. Of course, the other Colloquis-specific factor at play here was that the company was in major trouble. Management had been recently replaced and the company was scrambling to close necessary financing. Regardless, Steve was absolutely right. Sidebar: there’s no chance in hell that a startup is going to pay someone with no operating experience a six-figure salary. In fact, if you find a startup willing to pay you a six-figure salary when you have no experience, you should run in the other direction. They’ll be toast in a year. Despite my lack of experience, Steve saw how fired up I was and he gave me a shot. I asked that we formalize the arrangement in a letter. We worked out an offer letter outlining what my responsibilities would be, success metrics, etc. While I agreed to work for free he offered to pay my expenses: cell, internet, etc. It was April 2002 and the company was still trying to close its next financing round. A few months after I began working, Steve unfortunately had to lay off 75% of the New York office. It was terrible and those were the worst days, but the short story is that the remaining team turned the company around, built it back up, and we successfully sold Colloquis to Microsoft in 2006. I started earning a salary around the time Steve pared down the company to five in NY (I was the only person left on the business side plus Steve), and by the time of the sale I was a member of the management team. It was an amazing experience to have worked with such incredible people and to have lived through all the ups and downs with them. If there is any lesson to be learned from this it is that sometimes you need to realize that you know nothing – you must take a few steps back before you can start climbing again. Years later, and having the experience of hiring individuals as an employer, I am a big fan of “try before you buy” hiring practices, particularly for job seekers switching industries. It’s very difficult to know how someone will perform until they’re actually working. A period of purgatory gives a company the opportunity to get to know the individual, and likewise. These trials can take many forms and don’t necessarily translate into working for free. One path might be to give candidates a discrete paid (or unpaid) project to complete. In any case, timing and objectives should be laid out in writing beforehand so that both parties go into the evaluation period with the same expectations. While “try before you buy” is not possible (or even preferable) in many circumstances, it can be an effective tool to ensure that you get the right people on the bus.